A man sorts lobsters at Ready Seafood on April 28 in Portland. Every year, millions of dollars worth of Maine lobsters end up on European dinner plates. That figure could plummet if the European Union votes next spring to ban importing live North American lobsters. This week, the EU took a step closer to banning live American and Canadian lobsters as an invasive species and, thus, a threat to the native species of the crustacean in the North and Baltic seas. Sweden raised the alarm about importing live lobsters after 30 rogue North American lobsters were discovered off their shores, likely having escaped from nearby storage pounds or been freed by animal-rights activists. On Tuesday, the EU’s Scientific Forum on Invasive Alien Species declared that the risk to Europe’s marine life warrants further scientific investigation. Maine’s congressional delegation, united in its support of the state’s lobster industry, released a rare joint statement on Wednesday calling the invasive species panel’s decision “deeply disappointing.” Sens. 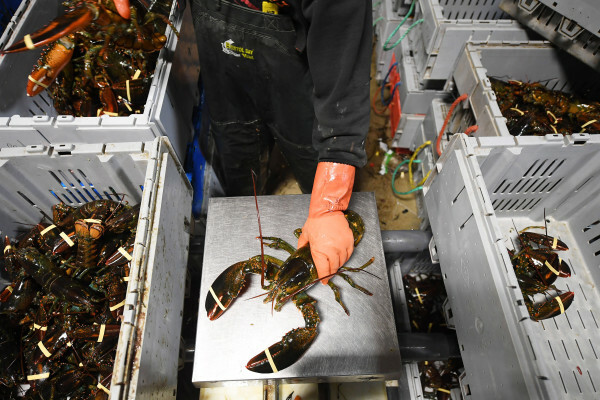 Susan Collins and Angus King and Reps. Chellie Pingree and Bruce Poliquin said there is no scientific justification for banning the importation of live lobsters. Brivio said the earliest that a ban could be approved is next spring. If the EU does ban live North American lobsters, the United States and Canada could appeal to the World Trade Organization. Sweden tried and failed in 2012 to ban live North American lobsters. Additional Maine-caught lobster likely is shipped to Europe via Canada, which last year imported $290 million worth of live Maine lobsters. Likewise Maine, whose lobster industry has a highly reciprocal relationship with its Canadian counterpart, last year imported $180 million worth of lobster from Canada. The ban in Europe would apply to all live lobsters exported from either country. Overall, more than $495 million worth of lobster was harvested last year in Maine, the nation’s leading lobster producer. Of that total, $331 million worth ended up being consumed abroad, according to the Department of Commerce. Much of the lobster exported to Europe is shipped during the Christmas holiday season, when seafood consumption on the continent soars. Last March, soon after Sweden targeted live lobster imports, Maine’s four members of Congress voiced opposition to a ban in a letter to President Barack Obama’s administration. In June, Maine’s delegation and other Congress from New England sent a similar letter to EU officials. Maine Lobstermen’s Association, the state’s largest commercial fishing industry group, has aligned itself with the congressional lobbying campaign. The European controversy marks the second time in four years that Maine lobsters have run into foreign opposition. In 2012, when Maine’s lobster harvest was so abundant that dockside prices plummeted to historic lows, Canadian lobstermen blockaded processing facilities in New Brunswick from taking deliveries from Maine. That conflict simmered down about a week later when a Canadian judge ordered the angry Canadians to let the deliveries from Maine through.